My first time taking yoga/pilates, what should I bring to class? 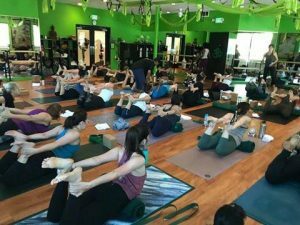 How do I know I will be in the same level as others in a yoga/pilates class? How hot is the yoga room? How much time should I give between eating and doing yoga/pilates? Should I buy my own yoga/pilates mat? How often do you clean your equipment and studio? Why should I come to your yoga/pilates studio, when I can just go to the gym? Why should I take mat pilates classes here, when I can just take them at the gym? My first time taking yoga/pilates. What should I bring to class? Please wear clothes you can move around in. You can bring your own yoga/pilates mat, towel, and water. But, we offer mats, towels, and water here if you forget. Plan to arrive 15 minutes early your first time to fill out some paperwork and get situated. You may also want to arrive early to relax in our reception area, where we offer hot tea and health oriented books for your reading pleasure. Nobody in class has the exact same needs as another, unless they have a twin. All levels are welcome to all classes. Our teachers are Yoga Alliance and Pilates certified. We are trained to show modifications and encourage resting when needed. The most important thing is that YOU get a stretch/workout for YOU. You are not trying to stretch/workout your neighbor; you are trying to stretch/workout yourself. Living in a world of comparison and competition, it’s hard not to do so. But, when you come to our studio you enter a different world. Our place is non-judgmental. Others students will respect you as you respect and take care of yourself. Other students are too busy focusing on their own balance, breath, and form to bother about what you’re doing. In yoga classes you are encouraged to rest in child pose or even do your own stretches when needed. In pilates classes there are many different modifications for your benefit. Also, during any class, feel free to take a break and go into our reception room for water or tea. Please respect yourself and go at your own pace, listening to your own needs. After all, “namaste” means to respect and appreciate yourself and those around you. Our yoga room is kept in a comfortable range of 74 to 79 degrees. The yin classes are warmer for deeper stretches. The heat helps our muscles stretch, but it’s not insufferably hot. The other class temperatures depend on how fast the class goes. We are NOT hot yoga. Bikram yoga, also known as hot yoga is performed at 106 degrees. We get this question a lot. Every person is different. Some people can eat a huge burrito 30 minutes before class and be totally fine. While others have trouble digesting a small cup of soup 3 hours before class. Use your experience with past exercise as a personal guide. Working on an empty stomach is not a good idea because you can get light headed. If you’re not sure, we recommend a small power bar or a piece of fruit no less than 30 minutes before. We highly recommend you get your own mat. Then, you can make sure it’s properly cleaned each time you use it. But, it you don’t have your own mat, we offer antimicrobial mats in our studio for you to borrow. We require all students to clean their borrowed mats and equipment after each class. We only use 100% natural and organic cleaner to clean everything in the studio, including the floors and walls! Our mats and equipment are cleaned after each class. We also have hand sanitizer and hand lotion in the studio and reception room. Our yoga/pilates room is only used for yoga/pilates classes. We only use natural cleaners to clean the entire studio, constantly monitoring the cleanliness of the floor. Our yoga/pilates teachers are certified through Yoga Alliance and high level pilates training companies. The gyms typically have aerobics instructors who just attend a weekend course to teach yoga/pilates classes. Most gyms are franchises and not privately owned. If a customer has a suggestion of how to better their experience at the gym, their suggestion takes time to hit the corporate offices. Even then, their suggestion may not be taken seriously unless many people repeatedly complain about it over a long period of time. Our yoga/pilates room has a quiet nice relaxing atmosphere, with cubbies for your personal items, and candles for yoga class. The gyms are meat markets, with people often staring at you in the room. You can also hear the loud dropping of weights and loud music pumping through the walls. Our yoga/pilates studio has a nice relaxing reception room, where you can get hot tea, filtered water, and read health related books. We also provide a great atmosphere where you can sit by a relaxing waterfall as you smell the aroma of scented oils. The gym doesn’t have one. Our studio is privately owned. The owner is there almost every day. The owner personally reads suggestions put in the suggestion box, and any necessary changes are put into consideration as soon as possible. The owner also personally answers all emails and voicemails as soon as possible. Most gyms are franchises and not privately owned. If a customer has a suggestion of how to better their experience at the gym, their suggestion takes time to hit the corporate offices. Even then, their suggestion may not be taken seriously unless many people repeatedly complain about it over a long period of time. Our studio personally sends an email to a student if a class is cancelled or changed, we are closed certain days, or anything comes up you might need to know about. When a class is cancelled at a gym, you often find out about it after you’ve showed up for the class. When certain days are closed at the gym, usually there is only a note on the front door. So, if you haven’t been to the gym lately, you won’t know. At our studio, you are in control of how much you pay a month. You have the option of being charged by the class, not the month. You can purchase a 5, 10, or 20 class pass. Then, you only pay for the classes you take. This means if you take a month vacation, you are not charged for the month you were not in the studio. The gym charges you by the month only. Mat pilates classes in our studio utilize resistance bands, toning rings, fitness balls, weights, and ballet barres. Many gyms don’t provide equipment for mat pilates.